What's the mark for these five towers? A cluster of 5 towers (300 foot tall, four-legged, red/white steel towers) were once a prominent landmark on the northern highway approach to Anchorage AK. Operated as a low-frequency radio facility by the Civil Aeronautics Administration since at least 1944 (when they were first monumented by the CGS) the towers were removed in the latter part of the 1980s as more modern technology rendered them obsolete. I logged the five towers on the geocaching.com site as 'destroyed' in June 2006, confident that the marks were gone. After all, the towers had been torn down... and the setting was listed on the NGS datasheets as 'MARKER: 43 = RADIO/TV TOWER'... so I reasoned 'no tower - no mark'. As I didn't have photographs of destroyed towers to send in, I didn't submit a report to the NGS. Last Saturday I found myself wandering through the tower field with fellow benchmarker chiknlips 45 in search of UV4382 RADIO, a survey disk placed in the southwest corner of the 5-tower pentagonally-shaped antenna field. As we talked about the destroyed towers he remarked 'you know, the data sheet says "POINT OBSERVED UPON AND TRAVERSED TO IS THE CENTER OF BASE" - even though the setting is described as "MARKER: 43 = RADIO/TV TOWER". I was mortified - had my inaccurate read of the datasheet led me to list these five towers as 'destroyed' prematurely? We found RADIO and dumped our gear there for a closer look at nearby UV4382 TOWER 5. The first tower artifact we stumbled across was one of the four corner foundations. Just over forty feet away (in the center of the 60' square formed by the tower's four foundations) we saw a massive object - a concrete cube with a double-Ibeam pulley mount in its center. The GPS units zeroed out on this center base using the adjusted coordinates for TOWER 5. A search of all five tower locations turned up exactly the same pattern of four bases and a concrete monolith in the dead center of the square with Ibeams protruding. So... is the mark the tower (destroyed) or the center base (as shown in the photo below)? We laughed over my angst, as chiknlips45 said 'hey - this could be five easy new finds!'... but I'd feel bad if my earlier logs were in error because of my careless read of the datasheets. Regardless of my angst - what's the mark for this station? IT IS A FOUR-LEGGED STEEL STRUCTURE, PAINTED IN ALTERNATE SECTIONS OF RED AND WHITE, AND IS 300 FEET HIGH. POINT OBSERVED UPON AND TRAVERSED TO IS THE CENTER OF BASE. Since the category is RADIO/TV TOWER, and the height and description of the tower is specified, it appears that this was an aerial intersection point, rather than a ground-based station. The center of the base probably was the point used for determining the coordinates. Since there is no benchmark in the foundation at that point, we have another vote for this being an aerial point. Four-legged steel towers seldom have a "center" foundation. If this one does, the purpose probably was to support the feedline or radiating element of the antenna system. Based upon the tower height (and the number of towers), this may have been a LORAN station (used in early navigation systems). Or, since the presence of five towers indicates a very directional transmitting/receiving pattern, it might have been designed to cover a specific air route and/or point-to-point communications. It's an interesting find! Meanwhile, it seems to me that your report to NGS is correct. However, perhaps someone else has a different theory. I must disagree with my esteemed colleague on this 'point' (pun very much intended). If the 'POINT OBSERVED UPON AND TRAVERSED TO IS THE CENTER OF BASE' then the tower is irrelevant to the mark (except to perhaps help you locate the base). If they had sighted on the light at the top of the mast, then it would now be destroyed. Apparently these antennae/masts went up and down, so the field crew was well aware that the location of the top could change within a few days/weeks/months. An unusual situation to be certain, normally the top of the mast/water tank/church spire WAS the point sighted on. I agree with AZcachemeister on this. The marker type data element is not always 100% accurate. Sometimes it is incorrect, usually in those cases when the type is drill hole and yet a disk was installed in the hole in 1927. In this particular case, there is no marker type for center of tower base, so RADIO/TV TOWER was selected as representing this mark. Here is a vaguely similar mark. It is the center of the base of a former tower which also had a PID at the top (the navigation light). Unfortunately, the navigation light has some incorrect 'Found it=Didn't find it' entries. I agree with Paul, but for other reasons (than Paul gives). Paul's analysis correctly applies to about 99 percent of tower/mast/spire intersection stations, but NorthWes' tower appears to be a different and uncommon animal. I suspect that the tower's characteristics (color, height, legs) were included in the description to assist in finding the station, but the station, itself, is the center of the base. That the tower is gone does not automatically lead to the conclusion that the station is destroyed. But, practically speaking, I think that it does lead to that conclusion. The description states that the station is the "center of the base". It does not say that the station is the "center of the large block of concrete with the pulley thing on it lying at or near the intersection of lines connecting the centers of each pair of opposite legs" . The "center" in this case may be a point that does not have a physical "mark", like a disk, chiseled cross, punch-hole, etc. And, even under the absolute best of conditions, a hobby grade GPS cannot "find" a point that is not marked with a physical feature. Now, if the bases of the tower's four legs all survive, it should be possible to "find" the "center" with two pieces of string. However, the center of the base of the tower, though located on or near the ground, is still an intersection station - it was meant to be found by sighting (on the tip of or on the apparent center of) the tower from a great distance. It was not meant to be used by running strings (or employing some other similar method) between pairs of legs. Therefore, if the only practically valid method of finding the station is gone, then, I think, the station is gone. The station may not have been the tower, but, absent a tower, the "station" has no meaning. I agree with NorthWes' original 2006 log of "Destroyed". p.s. Let's see, that makes it 2 - 2. Edit to add "Let's see, that makes it 2 - 2." By the same logic that the top of the tower corresponds to the center of the base, then any point above the base could be thought of as the point. For instance, a tripod could be set up on the base and centered over the center of the base. Certainly without the tower being there, the utility of the geographic point of the center of the base is dramatically less useful - but not gone. Similarly one could set up a bilby tower above the center of the base and use that. On a tangential note (pun intended), I wonder about the movement of the top of a tall tower in the wind. I recall being on top of the WTC and the lateral movement was quite noticeable. Of course a 4-leg radio tower with a thousand triangles in it would be pretty steady, but still, I wonder how far it moves. A fairly steady breeze would possibly move the top an inch or two. We realize the whole thing is moot since intersection stations are anachronistic, but it's an interesting discussion anyway. This kind of discussion is a lot more interesting than the usual Monday morning quarterbacking session here at work! Seventhing's analysis raises an interesting point - 'center of base'. Chiknlips45 & I strolled around to each of the five towers' locations and confirmed that not only the center structures were in place (all of which were identical in construction to the photograph in the orginal post), but all of the towers' leg foundations are in place as well (including the bolts). So, if the towers' "base" is the four foundation corners, then those corners exist for each of the five towers (in such good condition that most of the them could be reused without even cleaning the bolt threads). We were so intrigued by this question that we forgot to look for RADIO's reference marks! Chiknlips45 found this archive photo of the towers in a local historic photo online database. The photo was taken by Maynard C. Dahlstrom sometime in 1950, showing all towers (and the wild purple lilies which the Eklutna Flats are locally well-known for producing in profusion). This photo shows the southwest corner tower foundation. On each tower, one leg was torched off (as shown here) and the other three were 'unbolted'. Of additional interest, apparently this tower (#5) made such a deep impression in the ground when it fell that it couldn't be completely salvaged. There is a three-hundred-foot long double line of steel supports sticking up out of the ground in line away from the bases, tapering towards each other away from the foundations. The supports were torched off about a foot above ground level. Makes an interesting hazard pattern in the grass - wouldn't want to find them at speed on a snowmobile! Measurements were consistent at all five towers - the bases were 60' apart with the center structure located right in the middle. Each tower's center of base is 498' from the adjacent towers' centers, forming a pentagonal shape with the line between towers 2 & 3 roughly perpendicular to magnetic north. What do you make of the "POINT OBSERVED UPON AND TRAVERSED TO IS THE CENTER OF BASE". I'm not a surveyor, but the term TRAVERSED always brings to mind poles and chains, for accurate ground distance measurement, doesn't it? How could TRAVERSED apply when someone from a distance (where? doesn't say) was sighting on these towers as intersection stations. But of course it does say "FIRST OBSERVED", which is normally a give-away that it is an intersection station. All things considered, I'll side with destroyed. But TRAVERESED? Yes, it could have been early LORAN, or even SHORAN, but those are were normally singular installations. Could have been all sorts of things. Sturdy antenna towers tend to be re-used a lot. The NOAA Photo library has lots of pics of SHORAN antennas, but surprisingly none that I can find of LORAN antennas. Unbolt three legs, torch the last one, and run like heck? Wow! I would have paid to watch that (from a good distance!). Googling Pentagonal Antenna Array brings up all sorts of interesting stuff, including a lot to do with radar. I'm by no means an expert, but I'm thinking maybe not low frequency..... A little WWII era mis-direction, maybe... Hmmmm? Could mean moving horizontally in a direction, like crossing a river or measuring distance along the ground with chains. Could also mean moving horizontally by changing angles, like when a machine gun rotates about its vertical axis to change the direction of fire. In the sense used here, I took traverse to mean (something like) a surveyor set up his or her theolodite, sector or other angle-measuring device, fixed it upon a known point in the distance, swung it around to sight on the tower, and measured the angular distance between the two sighted points. Unfortunately, do not have sufficient command of the vocabulary - need a surveyor. Is there such a thing as traversing from the point observed straight down to the ground? The term "traverse" in surveying does have a very specific conotation. See page 9 of this document. This means that a traverse station has been located by a series of angle and distance measurements. It also implies that the traverse station was physically occupied by conventional surveying instruments in order to complete a closed figure, or a check on the measurements. Can't do that on top of a radio tower! I believe that the towers were originally located by conventional survey methods measuring to the center of the pulley thingy on the concrete base, and that they are therefore not destroyed, (but not really of much use for geodetic purposes, either). What do you make of the "POINT OBSERVED UPON AND TRAVERSED TO IS THE CENTER OF BASE". I believe it means that the location of each tower's base was based on traverses to station RADIO, the nearby first order horizontal control mark (and so is EKLUTNA). The location was likely measured from a small structure erected just above the base. This is why the centers of the bases, not the tops of the towers, are the stations. OK, here are my thoughts. Almost all Intersection Stations were positioned by observing directions from 3 or more know locations. This was the norm and the best, because the original observers were pointing on the same tower feature (often the top light), that later users would be pointing on. This case appears to be different. I think that station RADIO was set nearby for the main purpose of positioning the five antennas (hence the name). Since the antenna description states "POINT OBSERVED UPON AND TRAVERSED TO IS THE CENTER OF BASE", this, to me, means that the original surveyors traversed from station RADIO to the center point under each antenna. So, what does this mean? Here is the definition of a traverse from the NGS "Geodetic Glossary" (not on-line) "A route and a sequence of points between which distances and directions have been obtained by or from field measurements and have been used in determining locations of the points." For a diagram of a traverse, see: http://celebrating200years.noaa.gov/founda...l/traverse.html which is from one of my papers on the 200th Anniversary web site. Here is my guess as to how they were positioned. As mentioned in the message string above, real strings were stretched diagonally between the opposite legs to find the center point. At each antenna, a temporary center point was marked and a tripod was set up over each of these center points. Station RADIO was occupied with a theodolite and initialed upon a distant, known point (ideally two, second as a check). Then the angles were observed to each of the five tripods. Several repetitions would have been done, outliers rejected and the rest meaned. This provides the direction necessary for a traverse. I did an “INVERSE” computation (on NGS web site) from station RADIO to EKLUTNA RADIO TOWER 5. The distance is 58.0937 meters. This is less then the length of a 300 foot tape, so the surveyors would then have easily measured the horizontal distance between RADIO and each of the tower center points. This provides the distance necessary for a traverse. Then a “FORWARD” computation is done with the input being: the coordinates of RADIO and the directions and distances to each tower. The outputs are the positions of each tower center points. I would agree with GeorgeL. a side or face of a geometrical figure from which an altitude can be constructed; especially one on which the figure stands. That makes perfect sense. Thank you very much, George. So great to have professionals to answer our (amateur) questions. I definitely concur with destroyed on these. Good work, NorthWes'! Sounds like George would agree. Now - would these log as 'not found' at NGS, or 'destroyed'? for each of the five towers. I suppose it qualifies as 'destroyed' for sure. Excellent explanation from NGS Surveyor (w/ supporting concurrence of Z15). Thanks. Well, that raises a question of a higher level of abstraction: If the station was established as the "center of base" using a method identical to or similar to that so cogently described by NGS Surveyor, it follows that the station was/is/may very well always have been absolutely independent of the tower (as first suggested by AZ Cachemeister), and the station's existence is substantively unaffected by the current, non-standing status of the tower. [Conveniently disregarding, for the moment, the problem of the Marker = Tower entry on the NGS datasheet.] But we are benchmark hunters. We look for an object or symbol (chiseled cross, for example), that exists prior to and independent of our effort, and, generally, we don't claim to have "found" anything until we are sure we have found the object or symbol described in the datasheet. So, the question is: "Can you find a benchmark by running strings between two opposing pairs of concrete footings for a tower that no longer stands, and noting the point of intersection of the two strings?" Well, there's precedence. I direct your attention to HV1861 NW 1=NATL ACAD OF SCI. This is one of several "no-mark marks" in Washington, DC; it requires a tape or ruler to find. It does not exist as an object or symbol until the tape or ruler (and, maybe, a little soft-point pencil) is applied to the hunt. If you can find a "mark" by measuring with a ruler, then why not by icrossing a pair of strings. Therefore, I change my mind. I think NorthWes should run a few strings, confirm the coordinates of the intersection thereof within the tolerances of a handheld GPS, and log five more finds. I would, furthermore, NOT report these as found to the NGS until I had explained all to Deb Brown. Since the Marker = Tower, she may prefer that these five tower be treated as so many plain-vanilla intersection stations, and reported to the NGS only if and as DESTROYED. I've been reading the posts and giving this some thought. The aerial intersection points I've encountered always have ADJUSTED coordinates. Everyone is familiar with the "point observed" being a tower light, a ball on top of a water tank, or such. I've always assumed this meant that the precise coordinates were determined by careful observation from multiple known points. In the case of Northwes's 4-legged tower, the survey party was handed "a gift on a silver platter". Because the ground directly underneath the aerial point was accessible, and with there being a benchmark less than 300 feet away, it was easier to determine the position at ground level rather than taking sightings. Also, taking sightings from multiple points might have been difficult because of the topography in the vicinity--not to mention that the environment can be hostile under certain weather conditions. 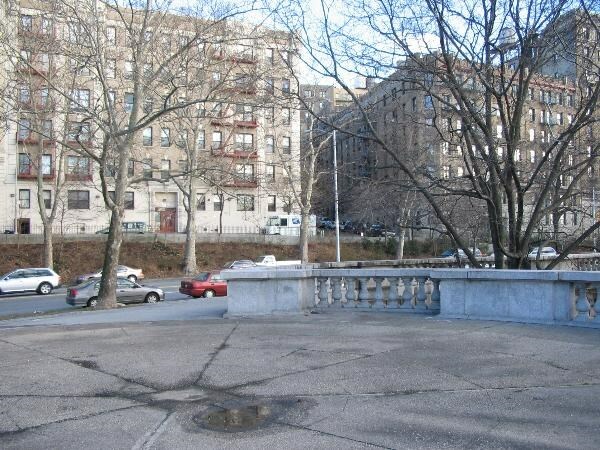 Call me stubborn, but I'm still of the opinion that this was an aerial intersection point, and that it no longer exists for the intended purpose. Hence, a "destroyed" report would be an accurate reflection of its status. I agree with Holtie, George, and Z15. Besides their explanations making a lot of sense, all of themm have more experience than most of us. I'm erring on the side of caution, and in agreement with Paul's analysis. Despite the ease of establishing the 'center of base' (yes - the center base structure is dead-center in each of the five tower foundations) the CGS's purpose in establishing the stations in 1944 appears to have been to provide a readily-visible aerial intersection point that could be seen throughout the upper reaches of Cook Inlet. 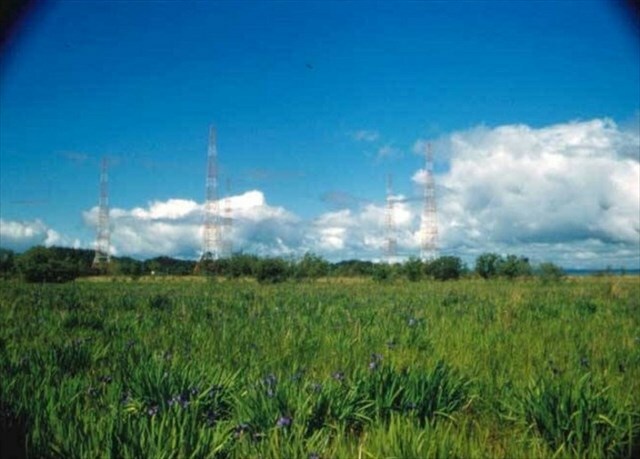 As a measure of how visible these 300' tall towers would be, nearby station PETERS E BASE (located one mile west of the towers on a flat marshy area without any brush or trees in any direction for more than two hundred yards) has a view on a clear day of the top of Mount McKinley 123 miles to the NNW, and the team establishing the PETERS E BASE station used UW6181 Mount Susitna Southern Spur (more than 45 miles west of this point) as a reference object. The five towers provided a readily-visible and usable reference point in an area covering as much as a thousand square miles - an extra 'aid to navigation' for the general public, beyond the airway navigation services the tower complex provided for aviators. Thanks again for the discussion of how the original monumentation write-up (method of establishing the point versus 'type' of point - 'Tower') impacts how we should view these stations today. It does appear the intent was to provide five aerial intersection points, which were established using Station RADIO via measurements to the center of the base of the tower structures. That the foundations and center base remain in place today for these destroyed towers doesn't seem to meet what the original purpose in establishing the aerial intersection stations would have been. I'll leave them logged as 'destroyed' on geocaching.com's website. And again - thanks for the kind and considerate approach to my confusion, folks! Despite the ease of establishing the 'center of base' (yes - the center base structure is dead-center in each of the five tower foundations) the CGS's purpose in establishing the stations in 1944 appears to have been to provide a readily-visible aerial intersection point that could be seen throughout the upper reaches of Cook Inlet. There seems little doubt (to me) that this antenna array had some very critical navigation function in that part of the continent. I've had fun yesterday & today trying to hunt down exactly what purpose they may have served, but have come up empty (so far - will keep trying!). Regardless of whether they were LORAN, SHORAN, or something else entirely, their EXACT position was critical to their function. It is clear to me that RADIO, and the five towers, were intentionally accurately surveyed to enable that airborne navigation function. That is critical. All radio / radar navigation stations must have accurately known positions, or their function cannot be properly performed. Their center was important, because it was the center of their RF radiation (reception?) pattern. I believe THAT was the reason they were surveyed, not to provide intersection stations for surveyors use in the area. Of course, once they were there, nothing would prevent a 1950++ era surveyor from using them. This has been a fun discussion, keeping me going on a couple slow work days! I'll see if I can find it on the old charts, but until then I'm guessing this was a low/medium-frequency radio range, which was the usual means of radio navigation along airways from around 1930 until VHF came in around 1950. The CAA or whoever probably gave its NAD27 position to the nearest second, but I don't see why it would be vital to know its position much better than that. It's not as if the radio beams it produced were that sharp-edged. I do think that the description is confusing, but it seems clear from tower 5 that the position was 'traversed to'. What is unclear or unknown is how this point on the ground was determined and if it was monumented, there is nothing mentioned. Besides the string intersection idea, if I were a surveying it and wanted to be sure I had a point directly under the tower, I would establish that point either with a zenith plumet (something any C&GS crew would have for plumbing towers), or by simply sighting the tower from a couple of nearby transit setups and dropping line down from the center of the tower to the ground and setting a point. The first thought I had though was if there was something in the tower structure itself, that was visible and near the ground, such as some symmetry in the structure, cross braces, etc. Nothing is that apparent though from the photos. Of course "Center of the base" does not necessarily imply directly below the top of the tower. There not being any called for monument, it would be hard to assert having found it without qualification. Assuming that there was a wire antenna suspended from the towers, I suspect the pulley in the center served one or both of the following uses: Lowering the antenna wire for repairs, and allowing counter-weights to adjust for the wire's expansion and contraction. For 15 years, I was a telegrapher on ship-to-shore and point-to-point commuication circuits, including 4 years at sea at an imaginary point called Ocean Station Victor (34N 164E), and the remainder at station KLC near Galveston*. We used similar arrangements in our antenna "farm". For those who follow such things, I suggest that the towers supported a rhombic (a highly-directional wire antenna in a diamond shape, and fed at one end) for point-to-point communication. There are references on the Web that say aviation ground stations also transmitted weather information via radioteletype. At least one station in Alaska is known to have had antennas pointed at Hawaii, although I looked at Northwes's tower placement on a map and I don't know if this would have been it. As mentioned in another post, the towers would have been laid out using a survey, following plans from the design engineers. Not only did the radiation pattern have to be precise, but the exact coordinates of towers this high would have been required on the FCC license and would have been published on aviation charts. *I may be the last person you will encounter who earned his living with a telegraph key. When I came into the profession in the late 1960's, it was a sunset industry and most of the brass pounders were much older than I. They since have become "silent keys", and only a handful of us remain. the exact coordinates of towers this high would have been required on the FCC license and would have been published on aviation charts. By "exact coordinates" you mean to the nearest second? Dunno if Alaska was different, but aeronautical charts for the rest of the US have never listed lat-lons for towers-- they just plot them on the chart itself, and nobody claims the plot is accurate even to the second. I am going to have to reiterate my previous assertion, and cite holtie22's post as backup. 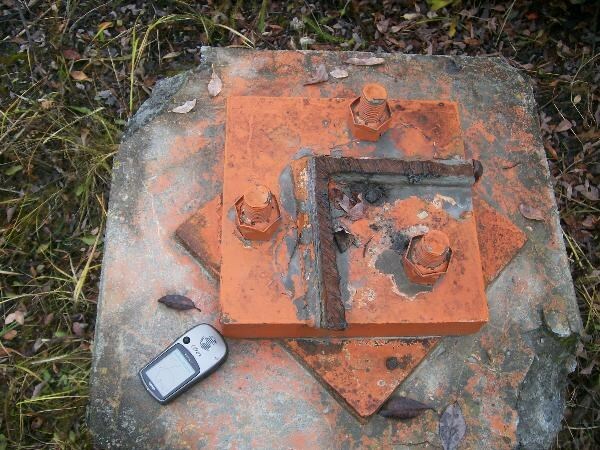 The marks are listed as type=tower, but it seems the field team ASSUMED the block with the pulley was perfectly centered under each tower, and that was the location measured...therefore that is the location of the 'mark'. If the surveying was done to provide a presumably precise location of the tower's vertical axis (and center of radiation), and if the radiating element was somehow held in place by the pulley, could this (apparently) bass-ackwards method of locating a tower structure perhaps be more accurate than long-distance observations? Could the field party have listed the marks as towers because precisely locating the towers was the reason for traversing to the center of the concrete bases? I agree. After holtie22 & NGS Surveyor's explanation of what "traverse" means in surveyor-speak, it seems that the point that was to become the "center of the base" preceded establishment of the base or erection of the tower. At first, I thought the station was destroyed because the tower would be used to locate the center of its base. Now, however, it seems that neither was the tower the station nor was the tower necessary to find the center of its base. p.s. I also think that the station exists independent of the concrete block with the pulley, regardless of where the block & pulley are located. If you've got four intact footings, you have (the original) "base". And, as every base has a center, you have a station (even if you don't have a mark). to go along with seventhings' NW 1=NATL ACAD OF SCI. OOPS! My comment referring to the CGS monumentation meant the towers were seconded into their role as elevation stations following the construction of the towers themselves. Airway navigation was first and foremost their reason for being. But - why not take a five-plex of three-hundred foot towers and put them to a secondary use that they're coincidentally quite well-suited to? Of late engineering projects up here seem to take the approach that they should be invisible - absurdly so at times. Wasn't the case back in the war years. And - I got out my old airway chart (I gave up flying back in the early '80s after damaging my sinuses - the least bit of ear blockage and I think I'm in a descending right-hand turn) which still showed the towers. Not very precisely marked - but there was no doubt you were to avoid the area! This conversation reinforces one aspect of benchmarking that I really enjoy - stations map our development - even when the development has been superseded or removed (towers and trains come to immediate mind). The datasheet designation, marker type, and description all say that the tower was the station. Where everyone is being misled is the "POINT OBSERVED UPON AND TRAVERSED TO IS THE CENTER OF BASE". Most intersection stations give "THE POINT OBSERVED UPON" in the description. These just happen to have the point observed upon at the base of the tower instead of near the top. I have to agree with NorthWes and say destroyed on this one. The towers are gone and there is no set physical point to occupy. QUOTE(PFF @ Oct 7 2008, 06:07 PM) the exact coordinates of towers this high would have been required on the FCC license and would have been published on aviation charts. Elsewhere in this thread, there has been speculation about which came first? Surveying for the tower placement, or afterward for use as an aerial station. Actually, there would have been multiple surveying operations during the construction of Northwes's radio facility. First, there would have been a boundary survey when the parcel was acquired by the government. Next, there would have been pre-construction surveys to stake the locations for all tower bases and any buildings. It is likely that additional surveys were used to check and recheck everything as work progressed. When the construction was finished, there would have been an "as built" survey which became the final authority for where everything is. And that's just the construction side of the coin. The placement of RADIO, and determining the coordinates for the tower centers, probably involved a different survey party--one which was concerned about determining Latitude and Longtitude with a high degree of accuracy, rather than how far a tower base was from the property line. 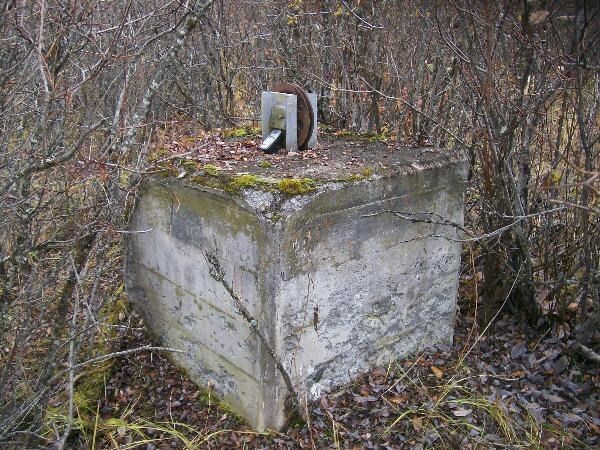 The bottom line is that we have an aerial intersection point, where the "point observed" was a pulley, anchored to a cement block, beneath the apex of a 4-legged radio tower. In the NGS database, this may be "one of a kind"! Here's an example of a similar case I found right in the middle of New York City. There was a band shell on the site with a conical roof with a finial. 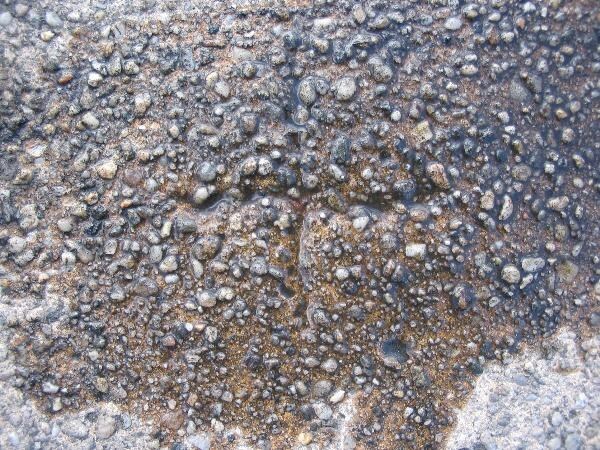 There was (still is) a chiseled cross on the concrete floor directly under the finial. The marker type says "MARKER: X = CHISELED CROSS" but the original description says "STATION IS FINIAL IN CENTER OF ROOF. A CROSS WAS CHISELED ON FLOOR BENEATH THE FINIAL." KU3955'CONCRETE WALK ON W SIDE OF RIVERSIDE DRIVE. KU3955'WITNESS MARK NO. 2 IS CENTER OF SMALL DRINKING FOUNTAIN. My conclusion was that this site was occupied and it is therefore a triangulation station, not an intersection station. The finial was merely an added bonus for observing the station from other stations, so a tripod with light was not needed. My report to the NGS was therefore "FOUND, GOOD CONDITION", even though the old structure was long gone. As an aside, it's remarkable how much effort we expend (both in the field and on this forum) for stations which may never be used again. I love it! What I find interesting about your station is the use of "witness marks" in addition to a "reference mark". The reference mark is a disk, such as we see frequently. The witness marks are a creative collection of other indicators! After looking at the historical photo of the Alaskan antennas, I immediately thought of the antenna “farm” just across the Severn River from Annapolis, Maryland. See: http://www.flickr.com/photos/12262796@N06/2924734570/ for a photo I took in 2002. I did a quick internet search and found this historical note: http://www.globalsecurity.org/military/fac...nbury-point.htm which explains the history of the antennas on the site. P.S. The other day I was watching an old Navy movie from the 1930's with scenes at the Naval Academy in Annapolis. Low and behold, there were the antennas in the background! I withdraw my suggestion that the towers were a LF/MF radio range-- I hadn't noticed that they formed a regular pentagon (with 500-ft sides). I know nothing about radio, but hard to see how such a layout would produce the four sort-of-quadrants (alternating morse A with morse N) of a range. P.P.S The U.S. Coast & Geodetic Survey made the nautical charts, the aeronautical charts and did the geodetic surveying for the U.S. So, the positions determined from the USC&GS survey of the 5 towers would have been used by all three programs. I downloaded a 1949 nautical chart of upper Cook Inlet and zoomed in to the area with the 5 antennas. See: http://www.flickr.com/photos/12262796@N06/2925084382/ for a chartlet showing Anchorage and the 5 antennas, and see: http://www.flickr.com/photos/12262796@N06/...in/photostream/ for a further enlarged chartlet showing just the antenna area. Great research, George. Very interesting. Thanks. I've spent some hours trying to search out what the antennas were used for. Saying they were CAA (and later FAA) radio range towers was..... um... a good cover. I've done enough research to say for sure they were not a four-course (Adcock) range. There is a slight possibility they were a CONSOLAN station (another obsolete medium frequency long range navigation system). But it does seem to fit best that they were military, and probably VLF (and maybe later HF) for Pacific Forces at that time. As an aside: As a USAF pilot in around 1973 or so, I actually got to fly a Low Frequency four-course Radio Range (Adcock Range), which transmitted the Morse "A" and "N" signals mentioned above. They had been long discontinued in the US, and this was one of the last surviving ones in the world (we were told) in the Carribean, Somewhere between Puerto Rico and Florida (run by the Bahamas maybe?). We asked the controlled if we could go that way, and fly the Amber Airway (yes, it was on our NOAA charts - wish I could find one - Amber 4 maybe?). The controller thought we were a little crazy, he loved it! So we flew along for an hour or so, navigating our C-9A (basically a DC-9) by aural tones. What a gas! But you bet we had our other more modern (50 years newer?) navaids fired up and were cross checking them also. I have absolutely nothing to add - I just wanted to say that the wisdom and investigation brought to this (and other threads) is simply amazing. It makes for a killer read! Great research! Thanks for sharing the information. As a telegrapher, I copied transmissions from NSS many times, and actually communicated 2-way on rare occasions. The awesome transmitting and receiving capabilities of these facilities became evident about two years ago when some Ham operators were given access briefly to an inactive Voice of America transmitting site in Ohio. They used special coax adapters to bridge the gap from their small transceiver to the feed line of a "curtain" antenna aimed at Europe. As expected, stations in Europe could be heard on 20 and 15 meters. But even on 80 meters (which should have been "dead" at that time of day), numerous 2-way contacts were conducted, with the Ohio operators being given extremely good reception reports! It reminded me of my station near Galveston. KLC (operated by ITT) had a 500-foot tall tower, with thirty-six 500-foot radials spreading out from the base. Using 5,000 watts of power, we dominated the International Distress and Calling channel on 500KHz (just below the standard AM broadcast band). And every year on December 25th, we were able to exchange Christmas greetings with a station in Wellington, New Zealand. From these experiences, it is clear to me that whatever was being done with the five towers in Alaska, it was being done well. Like NSS, the facility may have become obsolete due to technology. Or, perhaps it was "outed" like the Congressional bomb shelter at the Wintergreen Resort. But you can bet that somewhere, older gentlemen get together occasionally over a beer and talk fondly about "the Old Days", and the mission they performed--whatever it was.